When I got the evil virus last week, I was too sick to do much but watch TV. One day, I was too sick to get off the sofa, so I watched a Keeping Up With the Kardashians marathon. Enjoyed Bruce Jenner's facelift. My IQ dropped 30 points. But after I got the meds, I was well enough to watch hours of TV at my computer via Hulu. 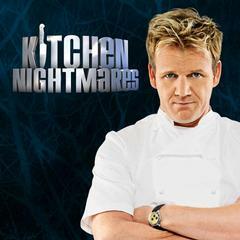 I got hooked on Kitchen Nightmares. Gordon Ramsey, who bares a striking resemblance to a Shar Pei, marches into Mom and Pop restaurants and restructures them. In one week, he turns those floundering enterprises into posh New York eateries. In one of the more ridiculous episodes, he turns a biker bar into a gastropub. The kitchen gets a scrub down, the kitchen staff learns how to make tall food, the menu is slimmed down, and the dining area is redesigned. In that week, Ramsey and his trademark potty mouth slaps his legs a dozen times and knocks heads together. It's a Cinderella story. There not a whole lot of reality in this reality show. Producers are clearly coaching the diners and there's surely a huge staff of people backstage pulling the strings. It's not clear if the restaurants that Ramsey saves (he only has 50% success rate) succeed because the food improves or because television viewers come to check out the reality show stars. And Ramsey seems unable to properly manage his own affairs. Still, there's something terribly fun about this show. It's nice to think that a business can make money if only it cleans under the stove and simplifies the menu. I'm also in the process of simplifying my work responsibilities and cleaning out my office and hard drive, so I've been using the show as inspiration. There's also a personal interest for me. Most of these restaurants are in the NYC suburbs – my backyard. The owners are all Bronxy Italians – my people. It features restaurant people — again, my people. My grandfather was an international Maitre D' who served Churchill and worked at the Waldorf Astoria in the 1950s. So, I can relate to the loud mouthed, meatball makers in these shows. Knowing that this show is complete crap, I am working my way through all the episodes. Let's see if I can turn around my own office nightmare by the end of the summer. A 50% success rate is amazingly high. If that’s right, he’s a bloody genius. There’s several restuants around Pittsburgh with family owners, huge menus, decor from the 50s (or earlier), and absolutely nothing ‘high’ served. They all seem to be doing fine. Of course, Pittsburgh is probably the only urban area where the mullet is still common. Amen to what Harry says. My dad has been involved in the restaurant business twice–first with some sit-down, family-oriented places, the second time with some quasi-Mexican fast food joints–and the failure rate across the board is very high. Speaking of restaurants, my husband thinks that the time has come for launching a Canadian-themed restaurant in the US. He has a very plausible menu.